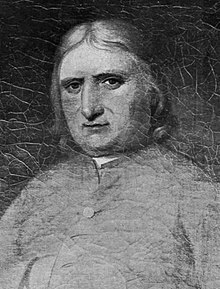 George Fox (July 1624 – 13 January 1691) was a founder of the Society of Friends, commonly known as the Quakers. I was come into the covenant of peace which was before wars and strife were. Be patterns, be examples in all countries, places, islands, nations wherever you come; that your carriage and life may preach among all sorts of people, and to them; then you will come to walk cheerfully over the world, answering that of God in everyone; whereby in them you may be a blessing, and make the witness of God in them to bless you. But as I had forsaken the priests, so I left the separate preachers also, and those esteemed the most experienced people; for I saw there was none among them all that could speak to my condition. And when all my hopes in them and in all men were gone, so that I had nothing outwardly to help me, nor could tell what to do, then, oh, then, I heard a voice which said, "There is one, even Christ Jesus, that can speak to thy condition"; and when I heard it my heart did leap for joy. Then the Lord let me see why there was none upon the earth that could speak to my condition, namely, that I might give Him all the glory; for all are concluded under sin, and shut up in unbelief as I had been, that Jesus Christ might have the pre-eminence who enlightens, and gives grace, and faith, and power. Thus when God doth work, who shall let [hinder] it? and this I knew experimentally [through experience]. The Lord showed me, so that I did see clearly, that he did not dwell in these temples which men had commanded and set up, but in people's hearts … his people were his temple, and he dwelt in them. I told [the Commonwealth Commissioners] I lived in the virtue of that life and power that took away the occasion of all wars... I told them I was come into the covenant of peace which was before wars and strife were. I was moved of the Lord to write a paper to the Protector, Oliver Cromwell; wherein I did, in the presence of the Lord God, declare that I denied the wearing or drawing of a carnal sword, or any other outward weapon, against him or any man; and that I was sent of God to stand a witness against all violence, and against the works of darkness; and to turn people from darkness to light; and to bring them from the causes of war and fighting, to the peaceable gospel. When I had written what the Lord had given me to write, I set my name to it, and gave it to Captain Drury to hand to Oliver Cromwell, which he did. When I came in I was moved to say, "Peace be in this house"; and I exhorted him to keep in the fear of God, that he might receive wisdom from Him, that by it he might be directed, and order all things under his hand to God's glory. l spoke much to him of Truth, and much discourse I had with him about religion; wherein he carried himself very moderately. But he said we quarrelled with priests, whom he called ministers. I told him I did not quarrel with them, but that they quarrelled with me and my friends. "But," said I, "if we own the prophets, Christ, and the apostles, we cannot hold up such teachers, prophets, and shepherds, as the prophets, Christ, and the apostles declared against; but we must declare against them by the same power and Spirit." Then I showed him that the prophets, Christ, and the apostles declared freely, and against them that did not declare freely; such as preached for filthy lucre, and divined for money, and preached for hire, and were covetous and greedy, that could never have enough; and that they that have the same spirit that Christ, and the prophets, and the apostles had, could not but declare against all such now, as they did then. As I spoke, he several times said, it was very good, and it was truth. I told him that all Christendom (so called) had the Scriptures, but they wanted the power and Spirit that those had who gave forth the Scriptures; and that was the reason they were not in fellowship with the Son, nor with the Father, nor with the Scriptures, nor one with another. Many more words I had with him; but people coming in, I drew a little back. As I was turning, he caught me by the hand, and with tears in his eyes said, "Come again to my house; for if thou and I were but an hour of a day together, we should be nearer one to the other"; adding that he wished me no more ill than he did to his own soul. I told him if he did he wronged his own soul; and admonished him to hearken to God's voice, that he might stand in his counsel, and obey it; and if he did so, that would keep him from hardness of heart; but if he did not hear God's voice, his heart would be hardened. He said it was true. Then I went out; and when Captain Drury came out after me he told me the Lord Protector had said I was at liberty, and might go whither I would. Then I was brought into a great hall, where the Protector's gentlemen were to dine. I asked them what they brought me thither for. They said it was by the Protector's order, that I might dine with them. I bid them let the Protector know that I would not eat of his bread, nor drink of his drink. When he heard this he said, "Now I see there is a people risen that I cannot win with gifts or honours, offices or places; but all other sects and people I can." It was told him again that we had forsaken our own possessions; and were not like to look for such things from him. The House being informed, that Two Quakers, (that is to say) George Fox, and Rob. Gressingham, have lately made a great Disturbance at Harwich; and that the said George Fox, who pretends to be a Preacher, did lately, in his preaching there, speak Words much reflecting on the Government and Ministry, to the near causing of a Mutiny, and is now committed by the Mayor and Magistrates there; Ordered, That the said George Fox, and Robert Gressingham, be forthwith brought up in Custody: And that the Sheriff of the County of Essex do receive them, and give his Assistance for the conveying them up accordingly, and delivering them into the Charge of the Serjeant at Arms attending this House. It was three hundred years ago, in October 1656, that George Fox had a memorable interview with Oliver Cromwell, Lord Protector of England. It was one of the great moments of a great century, for here, face to face, were two of the most powerful personalities of the age, the one the military dictator of the British Isles at the pinnacle of his worldly power, the other a crude, rustic preacher who had just spent eight months in one of England's foulest prisons. They met in Whitehall, at the very heart of the British government. Fox bluntly took the Protector to task for persecuting Friends when he should have protected them. Then characteristically he set about trying to make a Quaker out of Cromwell, to turn him to "the light of Christ who had enlightened every man that cometh into the world." Cromwell was in an argumentative mood and took issue with Fox's theology, but Fox had no patience with his objections. "The power of God riz in me," he wrote, "and I was moved to bid him lay down his crown at the feet of Jesus." The man who persisted in calling himself the "son of God"— he later acknowledged that he had many brothers — was demanding nothing less than that the military ruler of all England should forthwith disavow all violence and all coercion, make Christ's law of love the supreme law of the land, and substitute the mild dictates of the Sermon on the Mount for the Instrument of Government by which he ruled. In a word, Fox would have him make England a kind of pilot project for the Kingdom of Heaven. Fox was a revolutionary. He had no patience with the relativities and compromises of political life. His testimony was an uncompromising testimony for the radical Christian ethic of love and non-violence, and he would apply it in the arena of politics as in every other sphere of life. It is not recorded that Cromwell took his advice. Neither is it recorded that Fox ever receded an inch from his radical perfectionism. “Perhaps the most remarkable incident in Modern History,” says Teufelsdrockh, “is not the Diet of Worms, still less the Battle of Austerlitz, Waterloo, Peterloo, or any other Battle; but an incident passed carelessly over by most Historians, and treated with some degree of ridicule by others: namely, George Fox’s making to himself a suit of Leather.